Are your friends Franklin and Grant burning a Curve-sized hole in your pocket? Here's an idea: take 'em on down to your local T-Mobile shop and exchange them for an actual 8900 and the next two years of your life. Deal? Looks like the unwashed masses (read: non-business customers) will be able to pick up the latest and greatest non-3G BlackBerry for a penny shy of $150 on contract, or -- if you can stomach it -- a whopping $649.99 contract-free. Choose wisely. Update: It should be noted that this is out of Best Buy's inventory system, which -- as we've seen in the past -- has a tendency to totally bone the contract-free pricing. Have faith that it'll actually be a bit less. 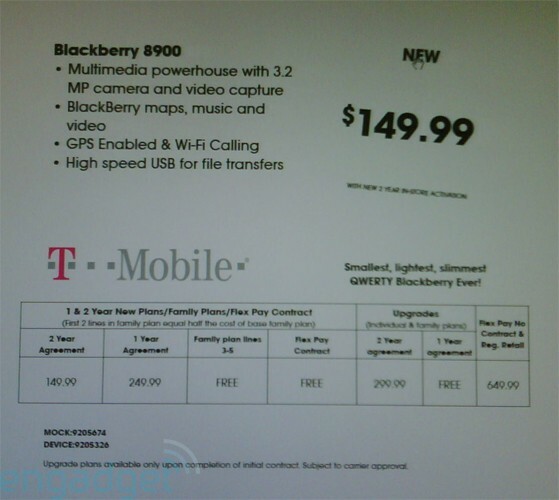 T-Mobile's BlackBerry Curve 8900 looking good for $149.99 originally appeared on Engadget on Mon, 09 Feb 2009 21:42:00 EST. Please see our terms for use of feeds.